When you are living an alkaline lifestyle, we recommend you consume highly absorbable vitamins and minerals from a micronutrient-rich diet full of biologically “active” plant foods. 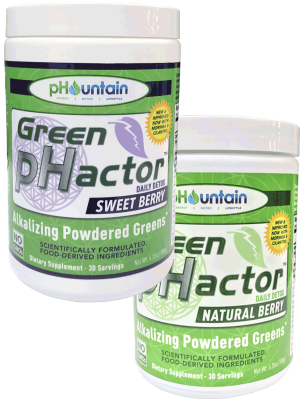 Made from an amazing blend of alkalizing greens, Green pHactor comes in three delicious flavors: Natural Berry and Sweet Berry. grass and oat grass juice, barley grass and barley grass juice, spirulina, and chlorella. Each scoop of Green pHactor offers about 3-4 servings of vegetables. Green pHactor supports your immune system, helps the ongoing regeneration of your cells and encourages the body’s natural detoxification process. *Hot Deal Applies to Green pHactor Very Berry Only.